A group of 110 Iowans has been waiting in Pennsylvania to get to work on hurricane-damaged power lines in New York. 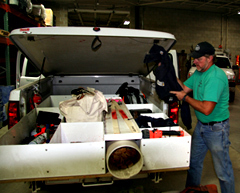 The Alliant Energy line crews got the word to pack up and head east on Sunday. They stopped in Pennsylvania waiting for the storm to clear before they’ll move into Lake Katrine, New York at the foot of the Catskill Mountains. Alliant spokesman, Justin Foss, says the Central Hudson Gas and Electric company requested the help from Iowa. Foss says they took their tools, some bucket trucks, some digging trucks, and a lot of pickup trucks. “We know that the utilities out there have got a lot of the bucket trucks out there and so usually you have two or three people working on a bucket truck, but when you increase that to four or five, you really are able to get work going a lot faster,” Floss explains. The crews will likely face a variety of conditions. “It brings flooding, it brings storms and wind damage and even at the base of the Catskill Mountains where these guys are going to be — it could bring a lot snow. And so that’s all stuff that our crews have worked in and they’re master at,” Foss says. “Of course what a hurricane does it brings it all at the same time. But our guys are prepared and ready for the challenge. The crews may be on the road for awhile. Foss says the crews were told to pack for two weeks, but their actual time in New York will depend on the amount and type of damage. He says tree damage takes longer to fix because you have to remove the trees before putting poles and wires back up. Floss says they sent crews as part of a mutual aid situation and the state the requests the aid foots the bill. Foss says they were glad to help out when the call came in from New York as Iowa got lots of help from them during the 2007 ice storm and the 2008 floods. Iowa’s other major utility company, MidAmerican Energy, sent a crew of 15 to Poughkeepsie, New York to help with the Hurricane Sandy recovery.